Hoping this newsletter will find you all well and happy. Many apologies for the lateness of this newsletter, we have been very busy in Kigali. Click here to download the full article as a PDF. So many wonderful things happen at our project and I am very grateful to those wonderful people who come to introduce the children to new and exciting ideas. 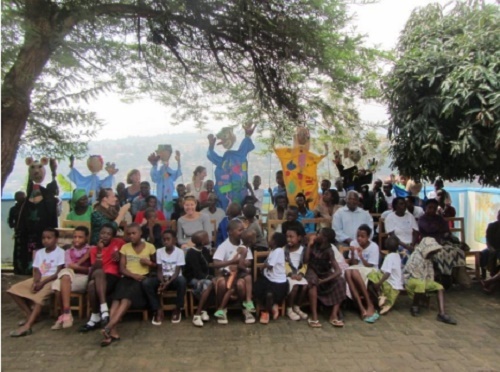 During December my friend Johane and her daughters arranged holiday workshops for the children in Primary 5 and primary 6 to make giant puppets. 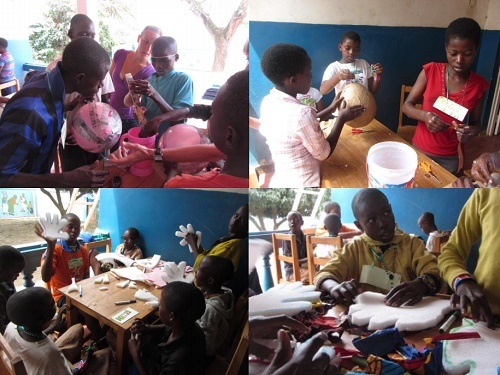 The normal school curriculum in Rwanda does not include art and creative activities so the children found the whole concept a challenge to both their creativity and their practical skills – cutting, sticking and their social skills because they were required to work in a team on a big idea, again something not normally required in school. Giant heads were made from large balloons covered with paper and giant hands were cut from foam. Our sewing group made the costumes and the puppets were given an identity. The puppets were decorated using scrap materials, a script was written and after three weeks, a lot of hard work and a great deal of fun, the show was ready to roll. Parents of the children involved, staff and invited guests, including Max bringing scrumptious cakes, arrived for the performance. No-one knew what to expect. We were introduced to a funny man, a bird, a mouse, three girls and a listening world. They wished us Merry Christmas, asked us to care for the environment, to be happy and for everyone to be at peace with each other and care for each other. Seven puppets in all with strong messages for us. Everyone had a wonderful time and the audience was very appreciative. Johane and family were presented with thank you cards, as was Heike, who was about to leave us to go travelling and the children danced for Johan to say thank you. And, of course, it would not be us if we did not join in! Thank you, Johane, we had a fantastic time.